It's no secret that Bashar al-Assad is beholden to Vladimir Putin - and we don't need nonverbal skills to figure this out. Yet this image provides us an utterly classic display of the Syrian President's beta body language bowing to the Russian President's alpha status. 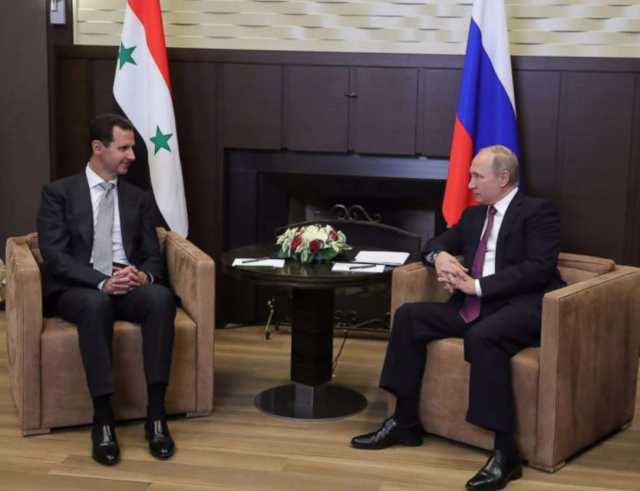 What's most obvious in this moment is the angle formed by Assad's legs - his entire legs are held almost straight, with his knees slightly closer together than his hips. His feet are also parallel (even slightly toed-in). He looks quite uncomfortable. Now look at Vladimir's legs - his upper legs are angled outward. Even though he is 7 inches (17.8 cm) shorter than Assad, Putin's knees are about 50% further apart than his Syrian subordinate. His lower legs are angled even further apart - with Putin's feet about 2.5x further than Assad's. Moreover, his feet are not pointed straight, but splayed outward. Putin's seated crotch display ("manspreading") is an overt dominance display. Bashar al-Assad's hands are configured in what is known as a Seated Fig-Leaf. In this context, such genital guarding is a profound display the low confidence and vulnerability he feels in Putin's presence. But former KGB officer's hands are not in protection-mode. Specifically, note that Putin's wrists are flexible and laid-back - while Assad's nervousness doesn't allow him this luxury. Bashar's feeling of beta-ness is further exemplified by the position of his upper arms - for, along with his elbows, they are drawn in, touching his torso. He's not using his armrests - not even touching them. In contrast, President Putin's arms are relaxed. Unlike Assad, his right elbow is taking up much more space - leaning on his armrest. Summary: Assad's nonverbal behavior is nervous, weak, and acquiescing - while Putin, the puppet-master, is relaxed, projecting his power.